College is EXPENSIVE! So where can you get supplies like discount textbooks at a great price? The most expensive thing after tuition and room & board and tech essentials for college is the slew of overpriced textbooks. Surely the best way to get deals on textbooks is by buying used…but do you know where to buy cheap textbooks? Turns out the campus book store is one of the worst places to buy them. Today, in preparation for the back to school season I wanted to share with you a few ideas on where to buy discount textbooks! When we’re done, be sure to check out this post on how to save money in college! I remember thinking in my college days that surely the professors and book publishers must be in cahoots. How else is it possible that a $100+ textbook needs to be updated every single year? 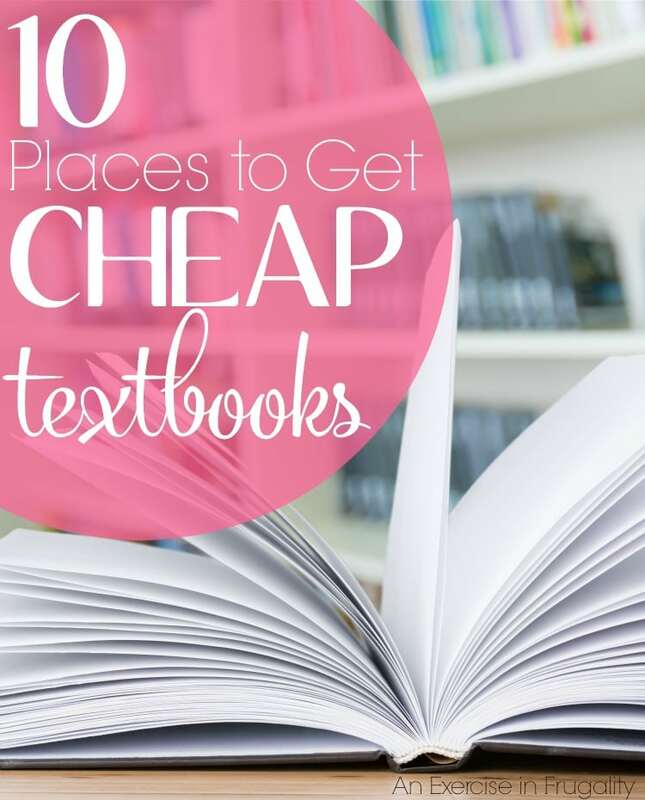 Of course there are plenty of other ways to save money on your textbooks, but if you decide to go the route of buying used textbooks, these are some of the best places to get your hands on a great deal! Whether or not there’s a conspiracy afoot, you don’t need to fall victim to the exorbitant prices of textbooks. Whether you buy new or used, there are better places to get more bang for your buck than the campus bookstore. 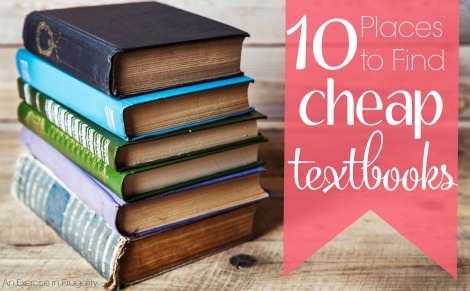 So here’s my top 10 list of where to buy cheap textbooks. Sometimes the cheapest college texbooks come from places where you might not think to look! These websites sell a great selection of discount textbooks to help keep college education as affordable as possible. This website actually has a search feature that allows you to input the title, author or ISBN of the textbook you’re searching for and helps you find places to compare prices. A great tool for any student, parent or professor! This site is actually owned by Ebay. You can buy, rent and sell your textbooks (when you’re done with them of course). Another great site that allows you to buy, rent and sell your textbooks. They have a liberal return policy (in case your instructor changes the required reading a week into the semester. URG!) and when you sell them your textbooks, they pay for shipping so you get to keep more of your money! They advertise up to 90% savings on textbooks. Another neat feature about this site is that they offer free access to the e-book version of your purchase for 7 days. This site is unique in that it will tell you if there are alternate international versions available at a better price. If it saves me money, I don’t care if I’m getting a book that spells “color” as c-o-l-o-u-r. I’ll take a European or Canadian version no problem! I think its kind of neat that they look for alternate editions! Another great site that offers free shipping for textbooks. You can search up to 10 ISBN numbers at the same time to make searching less of a chore. This site allows users to sell back their books at a fair rate. Get paid fast with direct deposit. Sure this suggestion is a lot more low-tech and less glamorous than some of the other options but often times you can find textbooks (either current or older editions) for FREE at your local or campus library. A couple caveats: you will likely have to renew several times over the course of the semester. You also will have to act quickly-put the books on hold the minute your syllabus comes out or you will probably miss out. Most libraries only carry one or two copies of any given book. Clearly not enough if the whole class is trying to borrow instead of buy! Where else can you buy cheap textbooks? You list some good sites Amazon definitely one of the top places for the lowest prices but no site is lowest all the time. I recommend using a price comparison tool to find out which of these top site is best.